When Britney Spears managed to have a pretty successful comeback recently, it was suggested that this was partly because she used the 'commercial' imagery of a circus. Apparently songs about circuses and clowns are always successful. Although I have to add, I know a few songs about this subject that didn't have any commercial success whatsoever. But this isn't one of them. 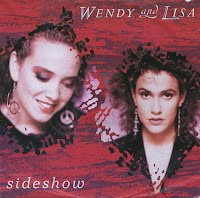 'Sideshow' was released as the second single by Wendy & Lisa, taken from their self-titled debut album. It did better in the UK singles chart than their debut single 'Waterfall', peaking at number 49. In the Dutch Top 40, this single reached number 30. 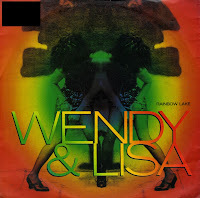 'Rainbow lake' was released as the second single from Wendy & Lisa's third album 'Eroica'. Released in November 1990, it was their last chart hit in the UK, although it only reached number 70 during the one week it charted. After this single, only 'Don't try to tell me' was released, after which the duo stopped recording for a long time. 'Lolly lolly' was the second single released from Wendy & Lisa's second album 'Fruit at the bottom' (1989). The single was remixed by their former employer Prince, who made the track sound bouncier and funkier than on the album. Despite his efforts, the single was only a minor hit in the UK, peaking at number 64. However, in the Netherlands 'Lolly lolly' shot to number 8. Throughout the Eighties, Wendy Melvoin and Lisa Coleman were an essential part of Prince's backing band The Revolution. After some internal struggle, the band was dismissed by Prince in October 1986, leaving Wendy & Lisa to find a record deal of their own. Their self-titled debut album was released in 1987. It featured their debut single 'Waterfall', which became a minor hit in the UK (peaking at number 66) and a big hit in the Netherlands (peaking at number 13). The B-side, 'The life', was re-released in 1995 as an A-side, entitled 'This is the life', after the song was included in the soundtrack of the movie 'Dangerous minds'. 'Satisfaction' was a single taken from Wendy & Lisa's second album 'Fruit at the bottom'. 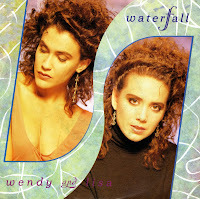 The track was written, produced and remixed for this single edition by Wendy & Lisa themselves. The single reached number 27 in the UK singles chart. In the Netherlands, the single did not chart. I missed out on this track completely, and decided to try out this single since it was so cheap. 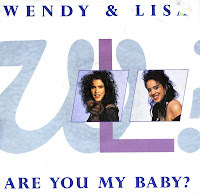 The track is not very different from other Wendy & Lisa material, so no surprises there. By the end of the eighties, I'd started buying cd's. I was never much of an lp buyer, so this was actually a big change. Suddenly, I started discovering albums by artists instead of just the single releases. It affected the way I bought my singles as well: more often than not, when I liked an album, I would buy the singles drawn from these albums whenever I could. 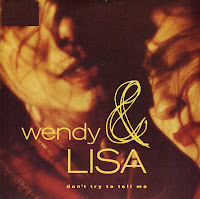 'Don't try to tell me' was one of the strongest tracks of Wendy & Lisa's 1990 album 'Eroica', so I was pleasantly surprised when I found out that it was also released as a single in the UK. The way I found out about this was pleasant as well: I saw the single in a shop where I was browsing the stock. It was a quick purchase. My collection: 7" single no. 1750. 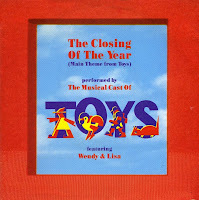 Taken from the soundtrack of the movie 'Toys', 'The closing of the year' was credited to The Musical Cast of Toys featuring Wendy & Lisa. In actual fact, it sounds like Wendy & Lisa featuring Seal, who also sings a verse in this song. This track was produced by Trevor Horn, who was working with Wendy & Lisa on an album at the time. That project, however, has never been released. 'The closing of the year' is a festive, positive, uplifting track. It never charted and has sunk into oblivion. I couldn't think of a more fitting title to end 2008 with in this blog. See you next year! Best known for their collaborations with Prince as members of his backing band The Revolution in the eighties, Wendy Melvoin and Lisa Coleman began their career as a duo in 1986. After releasing 'Wendy and Lisa' (1987) and 'Fruit at the bottom' (1989) for Columbia Records, they signed to Virgin records and released their third album 'Eroica'. 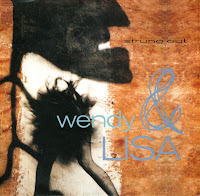 'Strung out' was the first single drawn from that album. It was a minor hit. I bought this single for the reason I bought loads of my singles: because I liked the track when I heard it. What's special about this single, however, is that it contains a non-album track that is very great indeed. Sometimes bands make great B-sides.